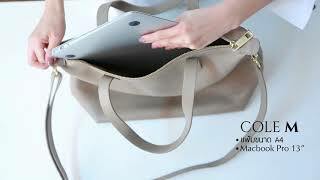 COLE bag from brand VERAPAIS is another great selling because it is simple but stylish. The bag ban be used every day and every occasion to meet all your needs. Made of durable leather as Cow Pebbled Leather, it is durable and comes with a removable padding to help maintain the bag shape. With a lot of space and compartment inside, you can put all your item as needed. The strap also can be adjusted as desired. If you like simplicity but just want to add some gimmick to the bag, we recommend Tassel, a two-tone tassel made of genuine leather. The first color is the same color as the bag. Another color is a Champagne Gold Metallic with the size of 4cm wide, 11.5cm high. Tassel can be used to mix and match with Nicole, Venti tote as well. Material - Made of genuine cowhide leather (Cow Pebbled Leather), with natural and soft of touch texture, easy to care, come with soft lining and beautiful sewing. The more you use, the more you like. Size of strap: strap width of 2 cm. x vertical length 40 – 48.5 cm. with adjustable feature between 68 – 120 cm. Special price when add to this bag to cart together with tassel only 5,000 Baht from 5,400 Baht.